This article follows on from the Overview of Stages of Team Development article. You will probably find it useful to read that article first. Have you ever taken your team, away from the workplace, to hang off ropes on the side of a mountain ... expecting this type of activity will bring you closer together and build the foundation for better teamwork and performance back in the workplace? Well, while these types of activities are lots of fun and they definitely have their time and place, they rarely translate into long-term, sustainable and successful development of high performance teams. The very best way to get teams working together, is to give them a task that is work related, is challenging and provides them with a benefit that they readily 'get'. And guess what ... of course the rest of this article is dedicated to a process that does just that! Below, is a process that I have successfully used with several organizations, to help workplace teams grow and develop, over a sustained period of time, toward more self-reliance. It is a process that provides structure to what ... for many organizations ... is a rather haphazard approach to team development. General descriptions of behavior (as described in the Stages of Team Development article) are important and valuable. However, when you want to add a real power punch to your team's growth and development ... then take the time to work with your team to develop a team pillar, for each of the functions that are critical to the successful operation of your business. What is a Team Pillar? along with the types of results you would anticipate from a team at that stage of development. You can develop pillars for any function that is important to your business. I've chosen these 8 samples (listed above) simply because they are fairly generic across many businesses. Working with various clients, we have developed team pillars for all types of functions. For example, for a corporate communications consulting firm we created pillars on analyzing data, proof-reading documents, business development. Really you can create team pillars for any function that is important to your business. Listed below are the steps to follow when creating (and then using) Team Pillars. Initially keep this process simple. Only identify the top six to eight functions that are critical to your business success and that your organization would benefit from your team becoming more highly capable within. Depending upon the 'political' environment in which you find yourself, you may decide to (initially) choose the functions that won't ruffle too many feathers outside your own department ... until you have some proof positive, that will help convince the naysayers, that using these Pillars works and has a long-term positive impact on the bottom-line. (See my story below on how we had to convince the finance department that the team pillars weren't going to send the company broke, rather that we expected it to make money for us). As indicated above, and what is probably blindingly obvious ... start with what you feel will be the easiest/less controversial function/(s) first. For example, Safety is often a fairly easy team pillar to get going with. Both in terms of creating and implementing along with convincing people that self-reliance is the way to go..
Once you have done this, you should have a document that looks similar to the samples I have provided you with. Speaking of those samples ...they are exactly that ... just samples. What I have in those sample pillars, may very well not be appropriate for your business environment, or describe the behaviors you expect at each stage. One of the most critical elements in creating team pillars is that it is done WITH your team, not for your team by a bunch of leaders in a backroom. Do that, and you may as well not even implement the process. The development of the team pillar, by the team, is critical because it is one of the best (and cheapest) team building resources and training and development activities that you will ever invest in and you can do it yourself! They begin to realize where they, both as individuals, and as a team are doing well ... and where improvement could happen. During the process they have to negotiate, and at times get personal agendas out on the table. They will laugh. They will battle ... there could even be tears. But with a good facilitator (and that shouldn't be you their Team Leader) -- you are too close --- they will transform into bigger picture thinkers and a stronger, more cohesive team. They will learn, they will discover, they will be exposed to new thinking. ... all in all everything you want in an exceptionally successful team building and training program and not a rope in sight! How Long Does it Take to Create a Team Pillar? It is an investment of time ~ and yes there can be lots of it. I have worked with teams that have been able to develop a team pillar within four hours ... and I have worked with a team that took 15 hours to develop one pillar. The length of time taken, depends upon the team's development, (how used they are to openly discussing and negotiating) and the 'heat' within the pillar. For example, you will find that when it comes to creating a team pillar around 'Improving Individual Performance', people's agendas can come to the fore. For example, the under-performers will likely try to sabotage and put the brakes on anything that shines the light on their lack of performance, and this can bog the process down. You will need your best leadership skills on that day (even with a good facilitator)! Don't Frighten the Dickens Out of Them! You will also find that if a team is closer to a Stage 1 team, as explained in the general descriptions of team development, than Stage 4, they will be less adventurous/extravagant in how they describe the behaviors of a Stage 4 team. It isn't because they are being obtuse. It is because they often can't see that far out ... even if you can ... because up to this point they haven't been trained to think this way. My recommendation is tread carefully to begin with. You don't want to frighten them by something that they aren't ready for. If you begin describing a Stage 4 team to them, which you see them achieving 10-15 years down the track (which the best analogy I can find, is similar to describing university, to a 4 year old kid about to go to kindergarten), you will frighten the dickens out of them. I worked with a team that, when we initially described the behaviors for the Pillar of Business Awareness, we thought we had been really stretching the boundaries. Two years later all our Stage 4 behaviors became our Stage 2 behaviors and we then took ourselves into the realms of what two years earlier we had thought were impossible pipedreams! They won't want to come on the journey (just as describing university to a kindergartener, will have them telling you I DON'T want to go to school!). It can be a case of too much too soon and can overwhelm even the brightest and most willing of team members. Pillars are dynamic documents that will change with time. So certainly stretch their thinking ... but don't frighten them. You may well have to settle for letting them describe a Stage 4 team ... as what you may well have liked to have seen described as a Stage 2 or 3 team ~ knowing that in the future you will work with them again to broaden their outlook on what behaviors describe Stage 4. Once you've got your team pillar documented, now comes the fun part. Again, working together, you and your team will assess which stage of team development best describes their performance level. Generally, if 90% of the team are exhibiting the behaviors described for that stage more than 80% of the time, you can safely assume they are operating at that level. If you thought you had had vigorous debate, as you were developing the Team Pillar, well assessing your team's stage of development can be even more rocky. Do make sure that you make use of team norms to ensure that, what are likely to be robust conversations don't become personal attacks. Which they can quickly degenerate into if you don't facilitate well ... I have seen pent up frustration at under-performers come to the fore. So do make sure that you are prepared to handle this well. You may not want your team to develop to self-managing for every single function. For example, I worked with a client who was quite clear that they would never want their team to develop beyond Stage 2 for business/financial literacy ~ even knowing that their business results would probably be diminished because of this decision. This is not a problem, as long as you are making a conscious decision and aware of the implications of that decision ... which in this example this team were crystal clear about. It is important to note that, whilst you may judge that a team is at, say Stage 2 or Stage 3 overall, there will be some functions at which they excel quite quickly and others it is like dragging teeth out of a wide awake tiger. A long, and difficult ... if not at times dangerous ... process! For example, generally, in terms of "Meeting Productivity Targets" teams very quickly become results focused and can be relied upon to achieve performance targets - often moving quite rapidly through Stage 1 to Stage 3-4. Part of the reason for this is that the results (or non-results) of the actions and activities are easily measured. But, in terms of "Providing Feedback To Each Other" you can expect the progress to Stage 4 to be quite slow! That is partly due to it being uncomfortable for anyone to raise performance issues with another, particularly a peer. And, partly because it is can be more challenging to measure how well people provide, along with the results of, performance feedback. It is quite common, to have a team who is performing as a Stage 3-4 team in terms of their capability to manage team productivity, but very much at Stage 1 in terms of improving individual performance. For example, as a group they can easily hold each other accountable for achieving team performance outcomes (say exhibiting Stage 3 behaviors in the function of "Managing Team Performance"), but when it comes time to address the under-performance of an individual they expect the team leader to do it (Stage 1 behaviors in the function of "Improving Individual Performance"). 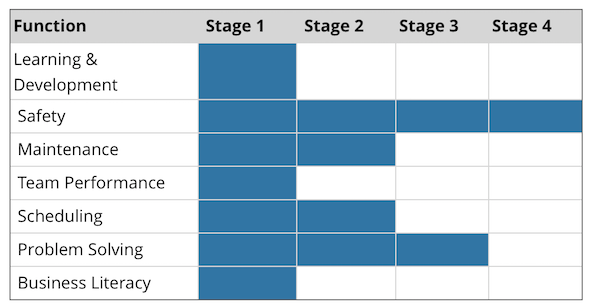 Most teams take a very long time to move from Stage 1 to Stage 2 in terms of "Improving Individual Performance". As a leader, you would probably agree that one of the most difficult tasks that confronts you is managing the under-performance of in﻿﻿dividual﻿﻿s - it seems to be a task that most people find difficult. Access the Successful Feedback training it will certainly help you with to handle the challenging conversations you need to have when performance issues raise their head. If you want you can contact us directly about how we could train your people in these all important skills. As an aside, 'improving individual performance issues', within the team is one of the greatest indicators of whether you have a high performance workplace or not. High performance organizations recognize the need to invest heavily in skilling their people to handle performance issues - both with people they report to, their peers and people who report to them. Using a grid like this helps you to begin to plan out where you need to focus, and you can begin to turn your attention to how you will help your team develop to the next stage. And this doesn't just mean training programs. Often it is the systems and the entrenched mindset and culture of the organization and its leaders, that needs 'fixing' much more than the development of individuals and teams. It could be things like working to change restrictive policies and procedures, it could be creating new systems, it could be freeing up the information flow. (So many teams are hindered by such restrictions ... which came about because of the old style thinking of trying to control everything). They can see there is a process, which systematically enables people to develop and over time take on more higher level decision making responsibility. They can see it is not a free-for-all which will result in anarchy. Needless to say, the Finance Department were, initially, totally against the idea and found it preposterous that we would want to 'trust' these people, with that sort of autonomy. It took the weighing in and influence of the most senior of leadership for this very strong barrier to be pushed through and a very reluctant (to say the least), Chief Financial Officer to be convinced that the sky wasn't about to fall. Initially team members were given authority to authorize payments of up to $50. Five years down the track, all team members had automatic authority to spend up to $3,000 and some, depending upon job requirements, had expenditure authority up to $50,000! Following the assessment, it will be very clear to you the style of leadership you are currently using and where you, the leader, need to grow and shift your style to effect long term changes in the team. As well, you will have a road map of where you need to focus on a daily basis in order to help your team shift, along the team development continuum, toward being a self-reliant, empowered team. This can be most challenging - because you have to step out of your comfort zone and release the reins. But if you aren't growing, learning and developing ... then how can you expect to grow and develop your people? The growth of teams in the workplace often directly correlates to the growth of their leadership. The simple fact that you are member of this site, tells me that you are committed to being at your best and bringing your people with you, so I'm confident that you and your team will experience the success you are ready for. It is fairly obvious that a leader, who can only use the behaviors of a Stage 2 leader, can never grow and develop his or her team through to a higher stage. So, in order for you to develop your team, you need to focus on the behaviors at the next level. In that way you will draw your people along with you. You will at times have to negotiate how you lead your team. You can expect to be challenged by your team members that you aren't acting as a Stage "x" team leader etc - don't let that worry you. Keep doing your best and regularly refer to your team pillar for inspiration on the types of behaviors you need to be role-modelling. 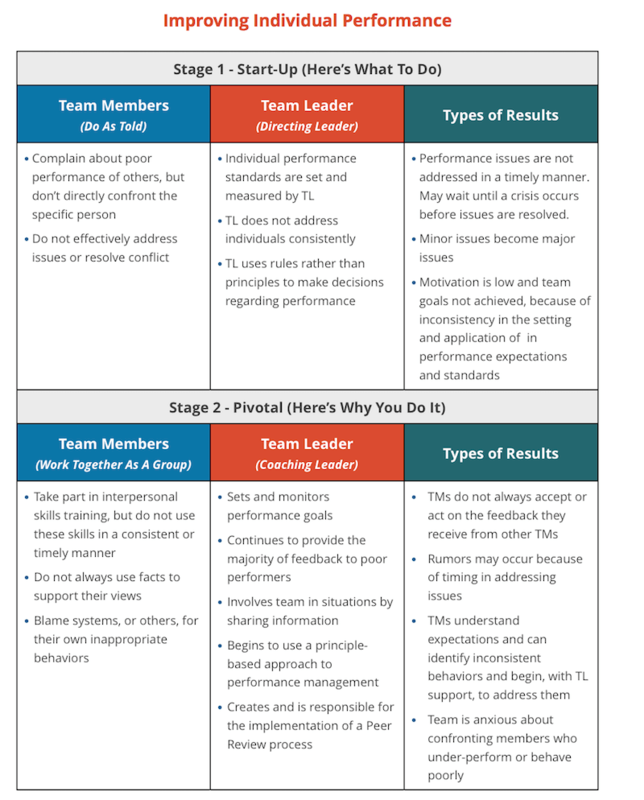 Here is an example of how I used team pillars with an under-performer, to negotiate the behaviors we needed to see in order for him to be treated at a higher level. I had taken over a production team, in a manufacturing facility, that had a team member who was underperforming. Among other poor performance issues, the thing that was driving his team members nuts was that, he had been regularly taking longer breaks than he was entitled to. The team were quite frustrated at having to cover for him, and a few had grumbled to me about it (not having the confidence to confront him directly, because he was a strong personality). I had to ensure I had the facts (not hearsay from the team members). So, when he was due for a break I would note the time he left and the time he returned. After a few days of data gathering, I spoke to him about his performance. During the conversation he began to complain that I was treating him as a Stage 1 Team Member and I shouldn't be monitoring his performance. I grabbed the Team Pillar and showed him that he had been acting as a Stage 1 Team Member, so this was the appropriate way to lead him. We were then able to discuss how he'd like to be treated, and the behaviors he'd need to exhibit in order to be treated differently. Using the guidelines in the pillars, we very quickly put in place a plan of action for him, that enabled him to lift his performance to a level that ensured he was treated the way he wanted - as a Stage 3 team member. A win all round! Team Pillars will become one of the power tools in your team development activities. When teams use Team Pillars, higher performance generally follows.